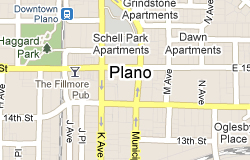 Plano, Texas Real Estate and Community Info. As might be expected of Plano, Texas, the 9th largest community in the state, one can find homes for sale in just about any price range, building style and neighborhood environment. In addition a strong real estate market, Plano boasts an excellent job market, in part because the city is home to some of the nation’s best-known companies, including Frito-Lay, Dr. Pepper and JC Penny. Shopping and dining choices are seemingly unlimited in the Plano area. Retail outlets like The Shops at Willow Bend, the Collin Creek Shopping Center, and The Shops at Legacy, paired with hundreds of restaurants, provide Plano residents with everything one could want without having to leave town. Within 30 miles of Plano, you will find about 90 public golf courses. These courses are just one example of the boundless recreational activities available here. Plano has enough parks, nature centers and public sports facilities in and around town to satisfy folks of all ages, interests and activity levels. Some of the highlights include more than 50 miles of walking, jogging and biking trails, senior citizen’s fitness and activity programs, fishing and wildlife viewing opportunities, a dog park and urban forestry programs. The secret’s out: In Plano, Texas, homes for sale tend to sell quickly. This blossoming city of about 270,000 consistently finds itself ranked among the best small cities in America. In fact, CNN Money awarded its No. 11 spot to Plano in 2006, and in 2010 Women’s Health magazine called Plano the #1 city in America for women’s quality of life. In addition to all of the aforementioned recreation, shopping and dining opportunities in Plano, the city also offers a stunning array of art galleries, museums and movie theaters. A great example of Plano’s thriving arts and culture is its Courtyard Theatre, located in the lovely Haggard Park Historic District. Housed in a refurbished downtown building, it presents myriad national art exhibits, plus stage and vocal performances throughout the year. The Plano Independent School District is made up of about 70 public and 16 private schools. A notable feature, unique to Plano’s school system, features 9th and 10th graders attending five “high schools,” while junior and senior students attend three “senior high” schools. Newsweek’s 2010 list of 1,000 top American high schools listed all three of Plano’s high schools in the top 500. The survey measured the number of advanced placement tests taken in relation to the number of graduating students. Medical and healthcare facilities include the Presbyterian Hospital of Plano, Medical Center of Plano and IHS Hospital at Plano. As a suburb of Dallas/Fort Worth, Plano is part of the Dallas Area Rapid Transit (DART) system. Recently, DART’s light rail project opened stations in the city, giving those who commute into the Dallas metro area a convenient public transportation option.